Houses & Homes VA: 4 Affordable Lighting Solutions for those Dark Closets! 4 Affordable Lighting Solutions for those Dark Closets! 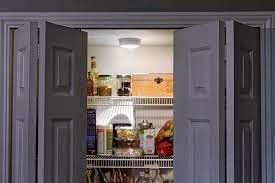 If you own an older home than you are all too familiar with dark, dingy closets that make it difficult to see due to a lack of proper lighting. This is quite common in older homes and can be a real hassle at times. Having an electrician install proper lighting can be expensive, especially if you have a number of closets in your home but you do have other choices. Here are some do it yourself options that are very affordable and easily removed if you opt for professional installation at a later time. This is a simple solution that requires nothing more than a screwdriver and batteries. Wireless motion lights are available just about anywhere and can be installed within minutes. The best part is that they will turn on automatically when sensing any movement and then turn off after you close the closet door. The LED types will virtually never burn out and will extend the battery life making them very convenient. Be sure to mount them where they can “see” you so that they will work properly and not behind boxes, clothing, etc. Here is a lighting solution that you may already have stored away in one of those dark closets! Today many people use “rope” lights or those long strips of lights for decorating during the holidays. If you have some unused strings of the white lights it would be a simple matter to install them into a dark closet and run an extension cord for power. Keep in mind that you will need to plug and unplug them as needed or you could install an on/off switch if your lights don’t already have one. While not as convenient as motion lights this is a cost effective solution if money is a consideration. Today there are many choices in battery operated lighting fixtures and many are quite nice. In fact, it’s hard to tell that some of them were not installed by an electrician. If you are looking for an attractive wireless light you will want to visit your local home improvement or hardware store. Of course, lesser expensive varieties are also available including light strips, slim lights, puck lights and others. Most of them use AA batteries that will last for months depending on how often you use them. Finally, if you are looking for the ultimate in convenience you might consider battery operated lights that come with a remote control. This allows you to mount the light high on the ceiling or anywhere and be able to turn it on and off with the touch of a button. The remotes will usually work up to 50 feet away (although I doubt that your closet is that large!) and many also use Led lights to save battery power. These lights are also useful on high ceilings and other locations where it is difficult to reach.